Quickly, before I chicken out! I don't post studio photos because the above is what my studio looks like. Can you see where I do my actual painting? Look carefully. No, not the table on the right by the sewing machine - that's my stamping & scrapbooking zone. 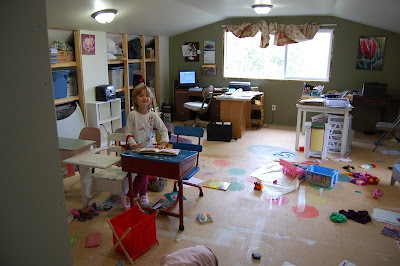 The little desks are our homeschool zone, and to the right of them, out of sight of the photo are the toyboxes and dress-up clothes. The shelves lining the walls hold craft supplies, art materials, framing supplies, and the assorted storage for household living - at least it is all at my fingertips, and easily accessible. Doors to hide the mess are on the agenda for this winter. Okay, stop looking and home in on the corner with the computer - see the black bag on the floor at the end of the desk? That bag holds my watercolor supplies. My palette is balancing just out of reach of little fingers on TOP of the computer monitor (good thing it's not a flat screen!). Completed but unframed paintings are put into my portfolio and stored in the closet beside the computer, beside my stash of painting boards. No, I don't have a lot of space. 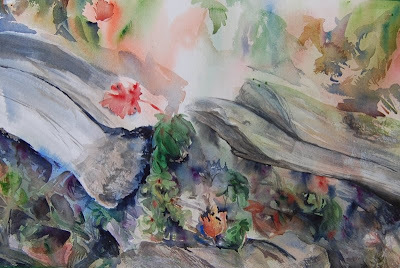 The great thing about watercolor is that I don't need much. Everything I need fits into that black attache bag, and I can pack and go at a moment's notice, paint outdoors, or downstairs if the kids need supervision. There's lots for my children to do in this "everything" room and so I paint while they play nearby. And I can even school my kids while I paint, though usually the most distracted I allow myself to get is to check and answer email while the girls are doing their workbooks. Am I a less "serious" artist because I don't have a fancy studio? Not at all. It is evidence of my commitment to my art that I have persisted in creating despite not having much space in which to do it. Prior to building our addition (with the enormous room shown above), our house was 575 sq. feet and I kept my painting bag beside the couch. On Saturday I participated in my second painting session at the Dawson Mall - and my last. While I enjoyed the experience, and I learned a few things, the interest in the paintings I had on exhibit wasn't noticeably increased by my presence. I liked having two hours without childish interruption in which to paint, but it's easier to focus in a more private setting. I love the vibrance of the colors, and I'm not going to do a lot more with it. It's a lot looser than my first moss paintings and much brighter. I think it shows more courage in that I didn't just add a black shadow when I felt unsure of an area. And I love some of the bright blues in the piece...and the oranges...and the greens. And the neutral hues in the painting make all those colors even brighter. I've yet to finish the deadwood and I'm not sure how much to do toward the top of the painting. According to my reference photo, that area should look much the same as the lower part, but I really like it the way it is. Part of being an artist is knowing when to call a painting complete.